With the Central government imposing ban on cotton export, the cotton ginners of Gujarat on Friday threatened to go on indefinite strike on 29-30 April. If they don’t get result they will go on indefinite strike from 5 May. The ginners of Gujarat have received support from the Bharatiya Kisan Sangh. Gujarat has nearly 1,000 ginning mills. Gujarat accounts for 40 per cent of total production of the commodity and 50 per cent of its export from India. Recently Chief Minister Narendra Modi wrote to the Prime Minister highlighting the woes of cotton farmers in the state on the issue. This year, the country has witnessed the cultivation of some 3 crore cotton bales of which Gujarat’s contribution is around 1 crore bales. 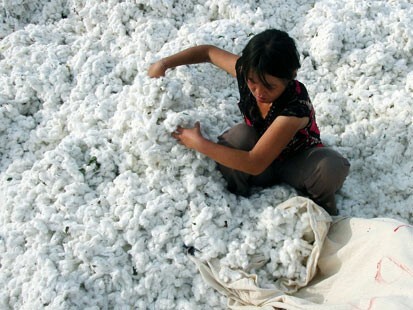 Following the steep price hike in cotton in the last six months, the Central government suspended its export from April 19. Earlier, the Central government had imposed export duty of Rs 2,500 per candy (370 kg) to control the export. Then, the cotton price had touched the Rs 30,000 per candy. Following the suspension of cotton’s export, the price of the commodity in domestic market has fallen to Rs 27,000 per candy. The representatives of ginners and farmers claimed that Gujarat is likely to be worst affected state following the ban on export. Gujarat accounts for nearly 50 per cent of total (cotton) export from India.Given the huge backlog of the commodity in the state, the Central government’s move to suspend export has left the farmers and ginners high and dry.So far, some 61 lakh bales have been exported this season of which state’s contribution is around 30 lakh bales. According to the association, the Central government should immediate lift the ban or farmers and ginners in the state will be badly hit . The association said while the CM has already written to the Government of India in this regard, the ginners have also represented the matter to the Agriculture Ministry. The association has threatened to go on indefinite strike from May 10 if their demands are not met. Within a week of imposing ban on cotton export, the cotton prices in the domestic market have decreased to Rs 685 per bale (20 kg) from Rs 715. And, with huge backlog and ban on the export, the farmers have no idea what to do with it.